Every morning, the fine folks at Sports Radio Interviews sift through the a.m. drive-time chatter to bring you the best interviews with coaches, players, and personalities across the sports landscape. Today: Brady has too much integrity for Washington. 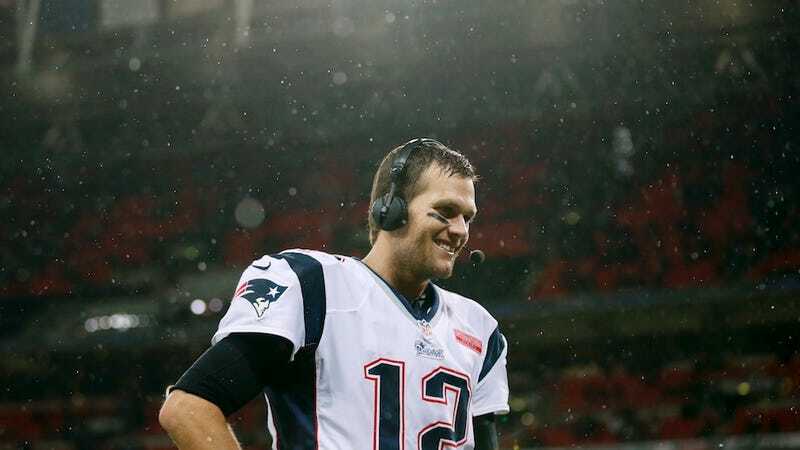 Tom Brady joined Jim Gray on Westwood One to discuss Hurricane Sandy's impact on Boston and New York, the emotions attached to playing games at times like these and the world of politics with the election looming tonight. "It's been a strange week. We were hit here in the suburbs of Boston with a lot of power outages, but what the people of New Jersey and New York have faced over this last week has been tough to watch." "We played in the Super Bowl in the 2001 season after 9/11, and U2 played the halftime performance, and I didn't see it in person but I just have these vivid memories of the halftime show that I saw on TV. I was in the locker room at the time, but when Bono pulled his coat open and there was an American flag stitched into the inside of his coat and all the names of all the people who lost their lives in the 9/11 tragedy. For a lot of reasons, that game stands out, but for a lot of other reasons, that year stands out for what our country had been through. What the people of New Jersey and New York have been through this last week has forever changes their lives. And I'm sure for a lot of the players, this last weekend, especially for the Giants in particular, what they played through [Sunday] night was I'm sure very emotional." "I follow it relatively closely. I enjoy watching, kind of, the banter that goes back and forth. I don't think I'll ever get into politics. Maybe at one point I thought that might be something I want to do, but I think you take a step back and you realize the impact that you can have as a citizen. And we always look, in times like this, to elect a person or an individual to change you or change situations or change things around. And I always believe in - certainly what I've learned from football and playing for the Patriots - is it starts within yourself. And that's the biggest lesson I've ever learned from this game. And I'm sure a lot of businesses, hopefully countries, move past whatever situations they may be in that are challenging … And you realize what you need to do to help your country or to help your team, or to help your company. That's the approach that I think I've always taken, certainly it's … in the culture of what our team's been all about." "Well I think it's just the frustration between both parties that have really been polarizing with one another to - from my perspective - not always do what's in the best interest of the country. And to fight just to fight. And maybe that's the way it's always been. I don't believe that's the way it always has to be. We do have a lot of people that want to make strong commitments to doing what we need to do to pull our country out of whatever tough situations we face, but we oftentimes look to the government to solve those things and sometimes there's too much of these special interests that get in the way of accomplishing greater good. And I think that's the frustrating part for a lot of Americans." "I was flipping between the two and it was interesting. You think, why do people love sports? Well, on one channel, people are talking about what they're going to do, and on another channel there's guys out there that are actually doing it. And it's an interesting take that I had that you can talk all you want about what you can do or what you can accomplish, and then you turn the channel and there are guys that are doing it without words, with action. And that's what it's about. That's what our country's been built on. It's been built on action. It's not about words; it's not about promises. It's about doing. And our coach always says, ‘Do your job and quit worrying about everybody else. Do what you need to do and trust that everyone is going to do what they need to do.' And that's been a great approach for me. … And I have a lot of empathy for people that can't do those type of things, and we need government for those type of situations, like natural disasters, which we just faced. Thank God for FEMA and for other government organizations that are there to help. But we as individuals are accountable for the future of this country, and as a parent, that's what I'm going to raise my kids with as well." • The Cowboys don't want to tamper with Sean Payton. • Matthew Stafford doesn't care about your fantasy team. • Eli Manning says things need to get better, and fast.